In Chinese astrology, each year is related to a Chinese zodiac animal according to the 12-year cycle. 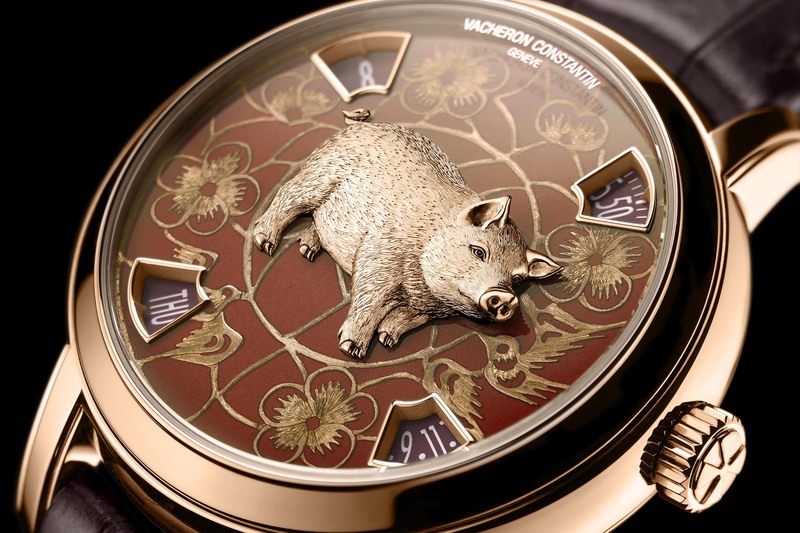 February 5th, 2019 marks the beginning of the year of the pig and in preparation, Vacheron Constantin is unveiling its latest addition to its Métiers d’Art The Legend Of The Chinese Zodiac series – Year Of The Pig. Available in either a Platinum or 18K 5N pink gold case, each version will be offered in a limited series of just 12 pieces. Read on for more details. The Métiers d’Art collection has always stood apart from all others offered by Vacheron Constantin. The reason for this can be found in the name, which loosely translates to “artistic workmanship” in English. 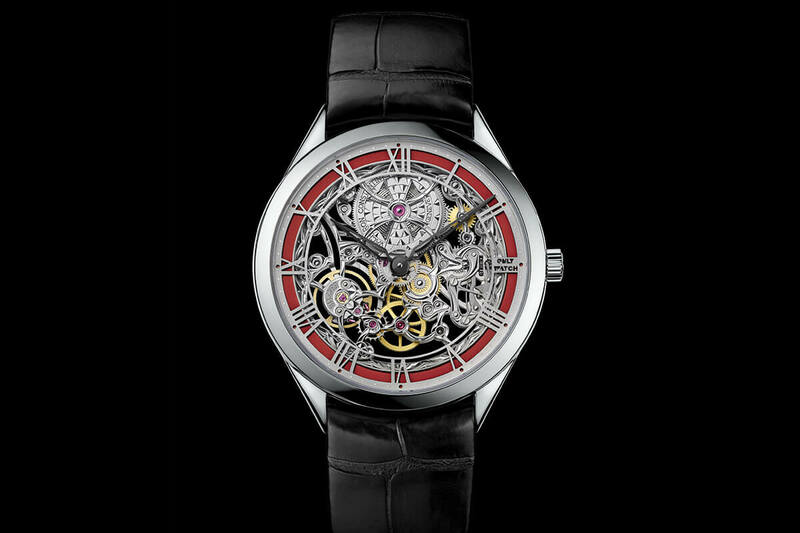 The focus is on the more artistic aspects of watchmaking as opposed to the technical. Engraving, enamelling, gem-setting and so forth. 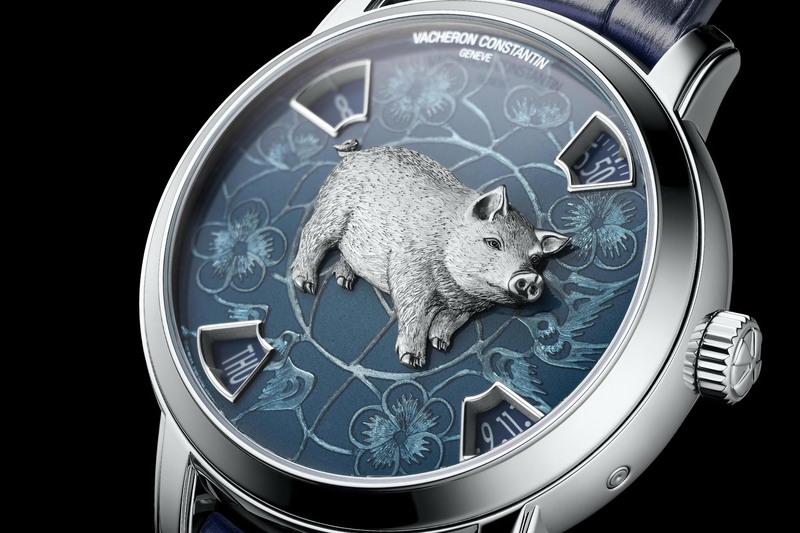 As a result, the skilled artisans from Vacheron Constantin have produced some truly spectacular looking pieces unlike anything else we’ve seen from the brand. This latest addition to the collection builds on the existing aesthetic already established by previous models in the Legend of the Chinese Zodiac series. 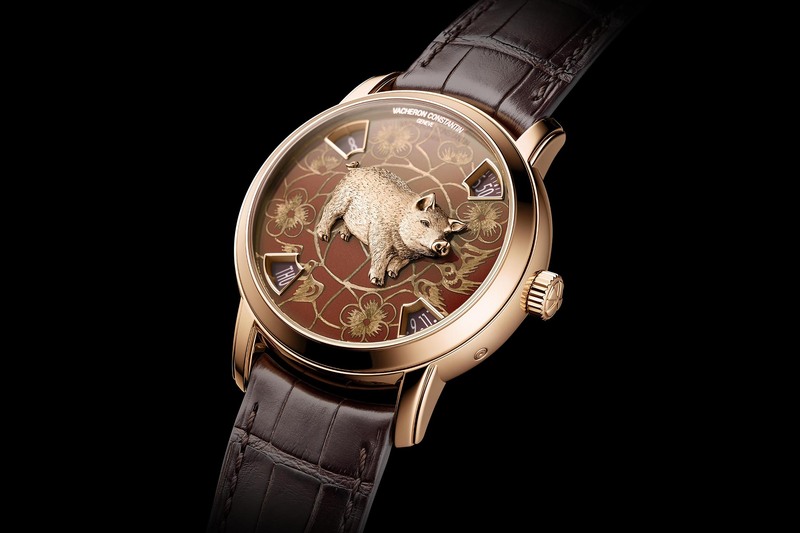 A distinctive foliage motif appears on the 18k gold dial, based on classic Chinese iconography. The pattern is etched directly in the metal and various accentuating reliefs have been used to create a sense of depth. This makes the vegetation appear to be floating over the dial as opposed to being carved directly into it. Once the pattern is complete, it’s time for the Grand Feu enamelling process to begin. Enamel powder is applied in successive layers, each layer followed by a firing in the kiln at temperatures between 800 and 900 degrees Celsius to enhance the intensity of the blue or bronze tones on the dial. 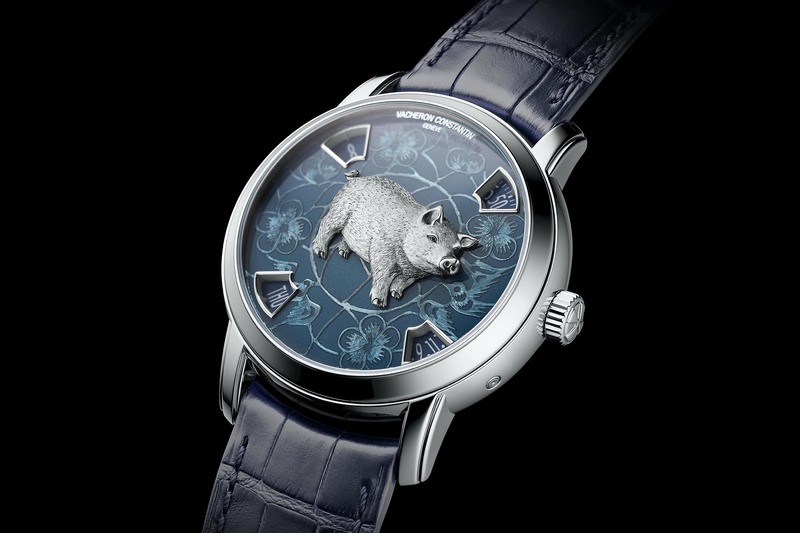 As the final pièce de résistance, a pig, made of platinum or pink gold, is hand engraved and delicately applied to the dial centre. As you’ve probably noticed already, there are no hands on the dial. This is to allow for maximum viewing of the exquisite artisan techniques on display. Instead, there are four apertures around the periphery. The top two display the hours and the minutes respectively, on two dragging discs. The bottom two display the day of the week and the date on jumping discs. Practical and easy to read, yet they don’t detract at all from the dial artwork. Presented in a 40mm platinum or pink gold case measuring 12.74mm thick, this model is powered by the Calibre 2460 G4, which is visible through a sapphire caseback. This self-winding Manufacture movement features a 22k oscillating weight adorned with the recurrent Maltese cross-inspired pattern. 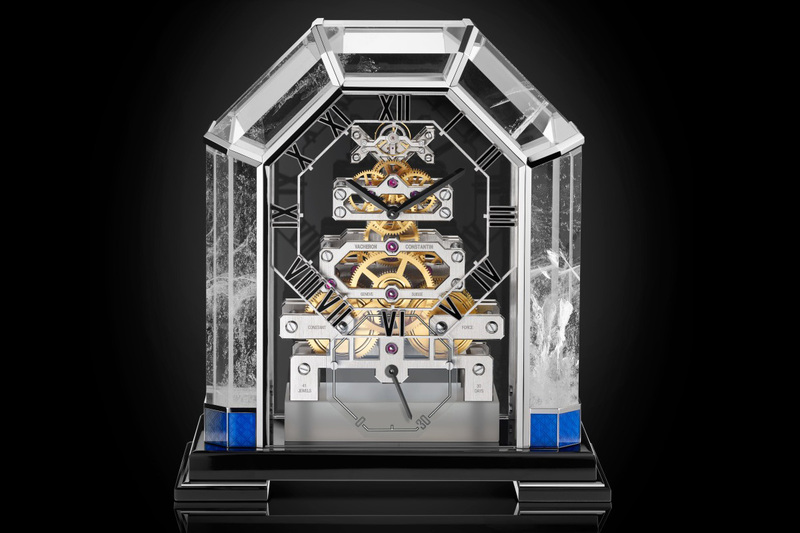 Comprised of 237 components, all of which have been expertly finished in accordance with the criteria of the Hallmark of Geneva, it offers an approximate power reserve of 40 hours. The watch is worn on a dark blue or brown Mississippiensis alligator leather strap matching the dial colour and closed with either a platinum or 18K 5N pink gold folding clasp. Price is EUR 136,000. 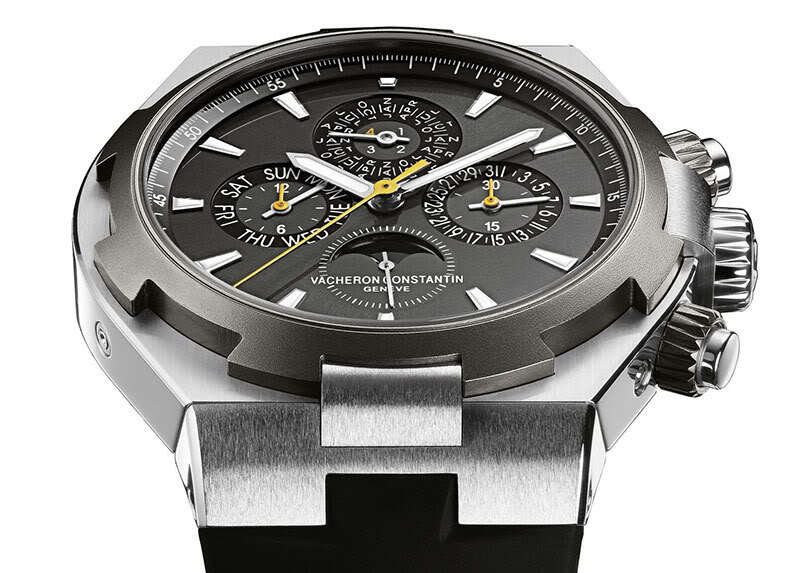 More details on vacheron-constantin.com. 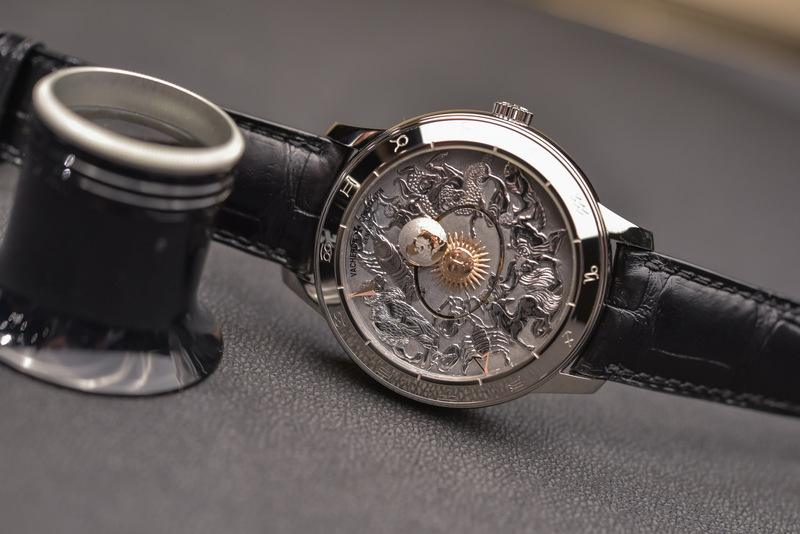 self-winding - 31 mm (11¼’’’) diameter, 6.05 mm thick - approximately 40 hours power reserve - 4 Hz (28,800 vibrations/hour) - 237 components - 27 jewels - Hallmark of Geneva. It is amazing how many of these watches are very clever but ultimately hideous. For me, you have to get past your own cultural bias and realize this may have additional meaning to a culture that is 4.000 years old. 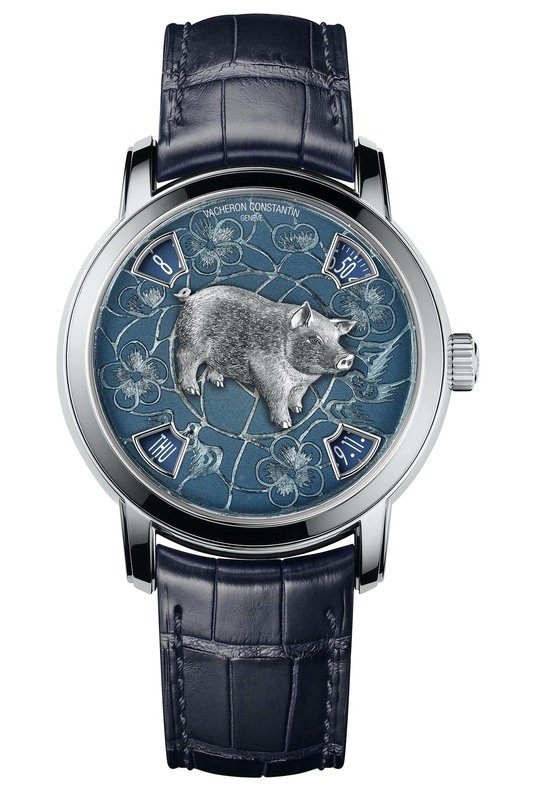 This is a beautiful piece, the pig is an amazing sculpture with incredible engraved detail, the calibre exquisite, the enamel beyond compare. I really feel the platinum is more successful here as the blue enamel seems to evoke an asian aesthetic that is missing on the pink. 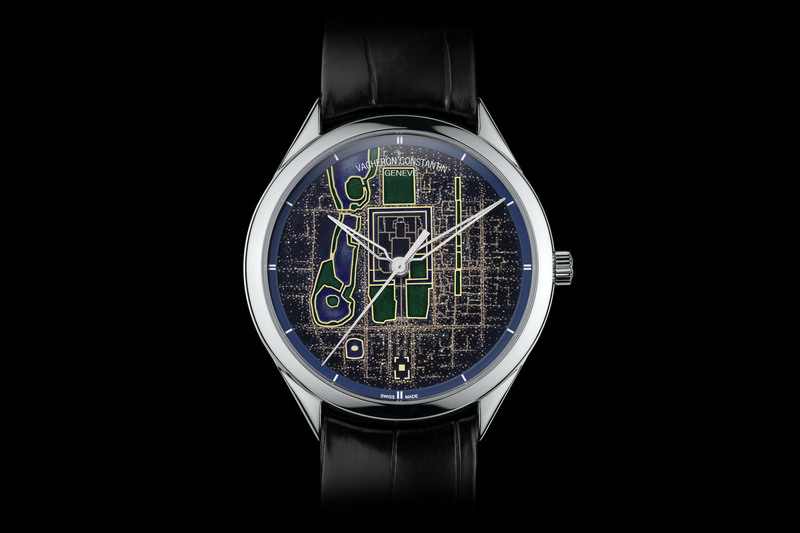 Aye, as soon as I saw the watch I knew that it wasn’t aimed at me, and instead a market that will appreciate it, particularly since Vacheron have a long historical connection with that market. Much like Vacheron’s other Metiers D’art models – Les Aerostiers – the way the sculpture looks like it is a fully three-dimensional model floating on top of the dial is testament to their skill. What did John Peel say about Emmerson, Lake and Palmer?